NASCAR qualifying on mile-and-a-half and larger tracks is broken and needs to be fixed. But what’s the answer? According to NASCAR Executive Vice President and Chief Racing Development Officer Steve O’Donnell on SiriusXM NASCAR Radio on Monday, the only feasible answer may be a return to single car qualifying where drafting now comes into play with the 2019 aero package. I wrote in this blog space late last week that the recent stance on moving cars to the back to start races if they fail to make laps in every round to which they advance or if they block someone else’s attempt to actually go out and make a lap was the answer. The way the new rules were implemented, or not, definitely wasn’t the answer, especially if you ask Clint Bowyer. In case you missed it, Bowyer felt Ryan Newman blocked him by “clogging the middle,” one of NASCAR’s new no-nos. Apparently, NASCAR officials didn’t believe Newman “clogged the middle” enough to warrant a penalty. Sure, Newman started in the back Sunday, but that was because his car failed pre-race inspection twice, not because of any qualifying infraction. At least everyone made a lap in all rounds they were supposed to at Texas, except for Alex Bowman, who wrecked in round one after posting a lap fast enough for round two, so I guess Texas qualifying was an improvement on last month’s Auto Club Speedway qualifying when none of the 12 drivers in the third and final round managed a last-round, timed lap. But it’s still not enough? What’s the answer? Single-car qualifying? According to driver David Ragan suggests heat races. Ragan said on the “Manifold Destiny” show on SiriusXM NASCAR Radio on Monday night that he was against a return to single-car qualifying, suggesting heat races instead. 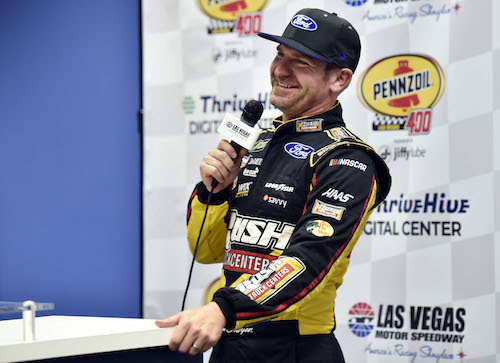 Jamie McMurray, now a broadcaster for NASCAR on FOX, said during Sunday’s pre-race broadcast that he thinks the current rules are good, as long as they’re enforced. I’m with McMurray. Just enforce the existing rules, and we may have a winner. Right now, though, I’m glad for short-track racing at Bristol (Tenn.) Motor Speedway and Richmond (Va.) Raceway the next couple of weeks. If I didn’t already love short tracks and those weren’t too of my favorite tracks, a break from possible qualifying drafting is a nice change of pace right now.